I noticed when the uprisings in the Middle East began in Tunisia and then spread to Egypt this spring that, for media and Web commentators, this was the social media youth revolution. Millennials see these events as the dawning moment for Generation Y, wherein decades of passivity exhibited by previous generations has been swept away by educated, Internet-savvy, globally-aware twenty-somethings. I also noticed that there have been some noises specifically made about their Generation X predecessors not being conscientious enough to overthrow tyranny and oppression. That was odd. 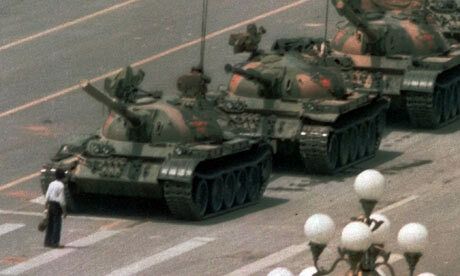 On that note, today is the anniversary of the army massacres at Tiananmen Square in 1989. We should not forget what social and political protest looked like in the period just before the Information Age kicked in - otherwise, we might not see the long term pattern of these events. The Chinese government has not forgotten. According to a Guardian article, Zhou Yongjun, a former Tiananmen student leader, was arrested in 2009 and was held and tried for fraud. In 1989, he was 21 years old. In other words, the Tech Revolution is indeed a decisive factor which does coincide with the fact that the majority of populations in developing nations are now under the age of 30. But the spirit and momentum of these democratic conflicts was not born this spring, in the same moment as the birth of Millennials' generational consciousness. To confuse the confluence of these three things is to misunderstand the larger conjunction of technology and democracy that has been transpiring for over two centuries. Below the jump, contemporary news coverage. Seeing these reports is déjà vu - all over again. 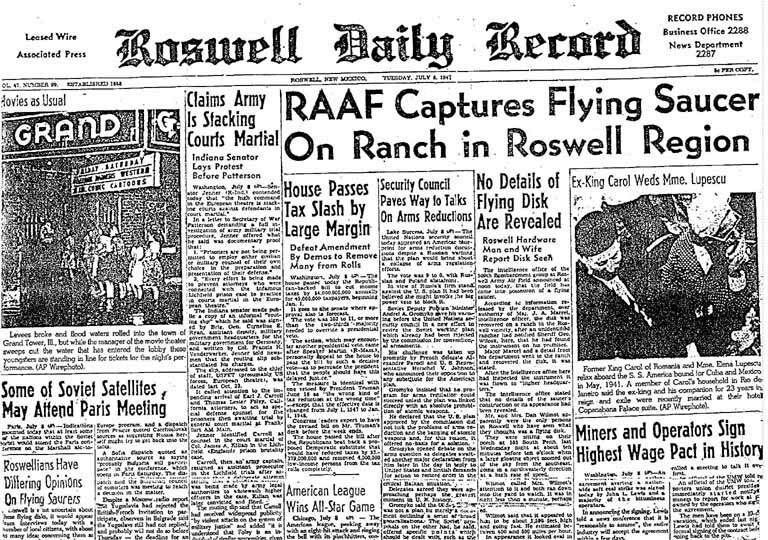 Roswell Daily Record (8 July 1947). Image Source: Wiki. I suppose once you're in Fox Mulder territory, you should go with the flow. If you're going to get into UFOs, you have to be prepared for things to get - strange. The Space Review is not willing to look at this book in the way the NYT has; the NYT made tongue-in-cheek references to Jacobsen's "dogged devotion to her research," which involved her talking to "a security guard — who, it turned out, had worked at Area 51 and became one of her most valuable sources." I find it hard to believe that that is a serious statement. Perhaps the NYT is standing back from this a bit, and taking the book as, say, a summer read that is an exercise in pop surrealism - or a metaphor for the Cold War? What would a serious investigation into Roswell look like, given that it is a cultural phenomenon in and of itself? It's the ultimate Millennial gnostic puzzle box. You can't get to the bottom of it, as this BBC reporter attempted to, without acknowledging the conspiracy theories. It's impossible to get to the 'real truth' - nor does anyone really want to. 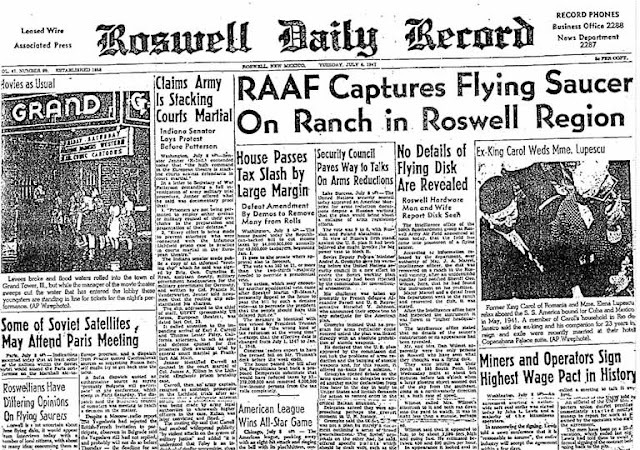 Jacobsen's book is out just in time for Roswell's 64th anniversary; the story still reflects a captured imagination about the incident, whatever it was. The most credible explanations I have seen point to some kernel of truth involving experimental aircraft and espionage. UFO reports conceivably prevent accurate information from circulating about new aviation and weapons systems. There may be some basis to this, considering the recent furor in the press about the downed helicopter in the bin Laden raid, which revealed stealth technology. 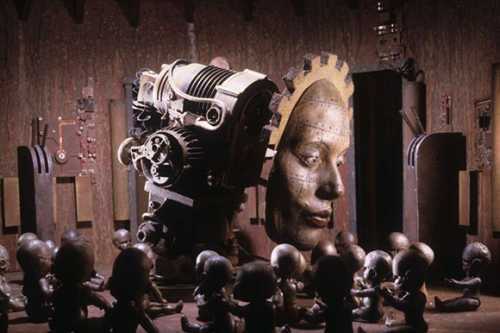 But that notion just opens up a new maze of conpsiracy theories. Along those lines, there has been an upsurge in UFO reports and sightings in the past few years. See here, here, here, here, here, here, here, here, here, here and here for a few of many examples. But with this review, The Space Review touched on something far more important about information sourcing, journalism and copyrights in the Internet age, where 500+ page books can be written based on the testimony of agile sources and a Web full of wild material. The Space Review criticizes the professional credibility of the NYT reporter Janet Maslin, asserting that journalists should have held Jacobsen to account for her sourcing. One reader of The Space Review agrees: "The reception for this book - good reviews in the [former] mainstreet media despite its obvious flaws - echos the similar reception that Craig Nelson's train wreck of a book, Rocket Men, got in 2009. One can only conclude that journalism standards simply no longer exist and the NYT, WaPo, NPR and the like, only are interested in selling papers or pumping up ratings." The review concludes that Jacobsen swiped her idea from a James Blish sci-fi short story, Tomb Tapper, in the December 1956 issue of Astounding Science Fiction. What struck me was what Jacobsen said about her sources: "When pressed about it on Nightline by Bill Weir, the only reporter who seems to remember what his job is, Jacobsen stated that as long as a source is credible to her, anything that source says is automatically credible and doesn’t require questioning—even if it defies common sense." Her subject matter and the degree of seriousness it merits notwithstanding, Jacobsen's statement reveals the erosion of previous standards for discerning reality beyond ourselves. This is the ultimate twisting of the purpose of citation, which is supposed to introduce some measure of historical objectivity into a study, by acknowledging a variety of opinions on a given question. In this case, Jacobsen's statement betrays a credo that expresses the opposite value. This is Postmodern subjectivity taken to a new extreme. It's a latter-day, Millennial version of the Boomer creed, "I'm OK, you're OK." If the source is 'believable' to Jacobsen personally as an individual, then it's 'good enough.' This makes me think of the hazards of egotism on the Internet, where narcissism is so often rewarded as an end in and of itself. Distinguishing truth from falsehood can be a tricky business at the best of times. But if the only modality for sorting out the difference is what any given random Internet egotist 'feels is true,' then we might as well say that in the Information Age, when data has triumphed, the means for recognizing truth and fiction in that data, as we once knew them, no longer exist. 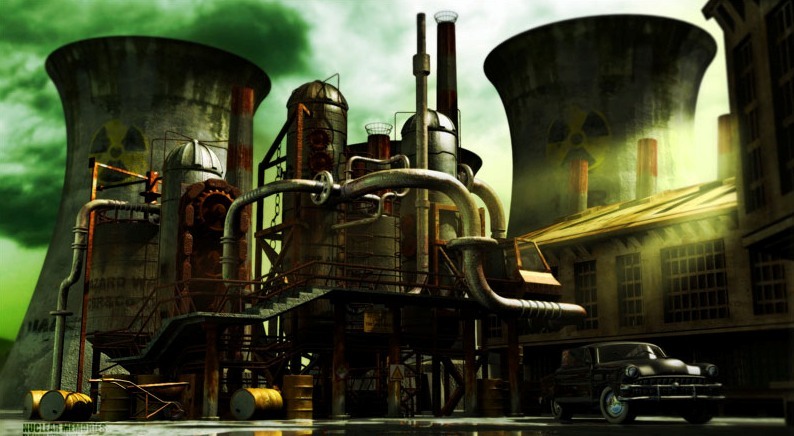 Addendum: CIA documents have just been declassified that outlines some of the work done in Area 51: see reports here, here and other CIA information was released today, see here. See all my posts on Aliens. See all my posts on Copyright. 22 July 2009 total solar eclipse. Image Source: World Culture Pictorial. June and July bring three eclipses, spaced two weeks apart. 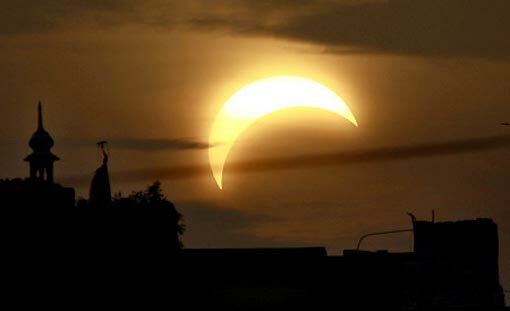 The first is a partial solar eclipse, visible in the Arctic regions, on June 1; the second will be a total lunar eclipse, visible in Africa and India, on June 15; the third is a partial solar eclipse, visible in the Antarctic regions, on July 1. A short comment from National Geographic reminds us: "Watching an eclipse, even a partial one, is an opportunity to witness the ongoing cycles of our solar system, Telus's Dyer said. ... 'Though we can predict eclipse with astonishing accuracy, they are created by forces far beyond our control,' he said. 'Eclipses remind us of our place in the universe.'" But because these events inspire such awe, superstitions are never far away. They seem to mark moments when the clockwork of the heavens, which can be rationally measured by bodies like NASA, overlap with our sense of the larger meaning of that clockwork (however defined). Hence, there is an eclipse in Homer's Odyssey: "The sun has perished out of heaven, and an evil mist has overspread the world." Incidentally, astronomers have calculated the one noon-time full solar eclipse in the time when and region where Homer might have written his epic poem - April 16, 1178 BCE. However, the actual time when Homer lived is disputed, and is set either as the 12th or 8th century BCE. The debate over when Homer lived and who he was is called the 'Homeric Question.' There are no reliable sources from antiquity to confirm the life of Homer as an individual, and the Iliad and Odyssey are dated differently (8th century BCE) than their author is. 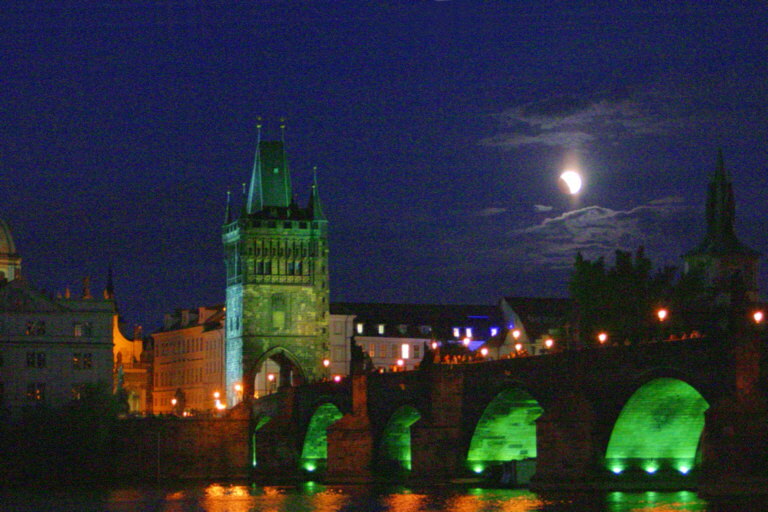 4 May 2004 Lunar Eclipse in Prague © Astronomy by Frank. Eclipses appear often in the mythology of different cultures most often as symbols of obliteration, fear, and the overthrow of the natural order of things. Eclipses were the great omens of fated, large-scale events. The word eclipse comes from a Greek word meaning "abandonment." Quite literally, an eclipse was seen as the Sun abandoning the earth. Every six months, eclipses show the turning points in our lives. They indicate what we are to accomplish for the following year to 3 years. They bring in news and events that are sometimes "out of the blue". Time seems to speed up. In a positive sense, eclipses can clear what may obscure the way forward. Remember that the key words for eclipses are emphasis and crisis. Eclipses are contrary to the status quo. If impacted by one of these eclipses, your life will not run on the same track it has been on. But that can be a good thing. Susan Miller concurs, and believes we will all face massive changes in our lives: "eclipses are the most dramatic tool the universe uses to create vast change. We'd never make those shifts ourselves." She's spending the whole month giving us eclipse updates. Plus she has a page devoted to eclipses, where she says that eclipses, "always bring a twist that you won't expect." 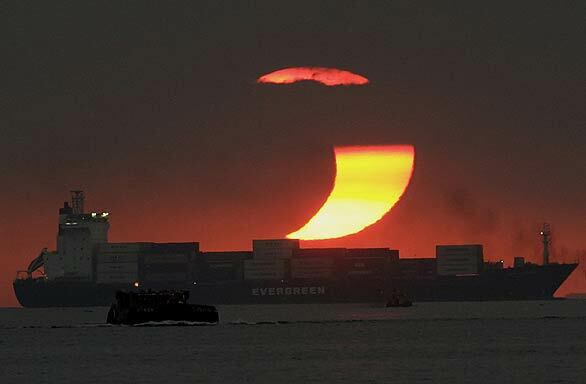 2009 Partial solar eclipse as seen from Manila Bay in the Philippines. Image Source: National Geographic. The blogger at Adventures in Astrology proclaims, "The eclipses are coming! The eclipses are coming!" and insists that eclipses pull the veils from our eyes, forcing us to see the truth in things: "Astrologers usually talk about how shadow and light are 'revealed' in an eclipse and how this symbolizes revelations in our lives as well--revelations that can cause big deal changes." Elsa P., astrologer at Astro Dispatch, declares: "Doors must open. ... Have a back-up. Know when to give up. Or when to click over to the other thing. The summer 2011 eclipses may close doors and open new passageways previously unimaginable." 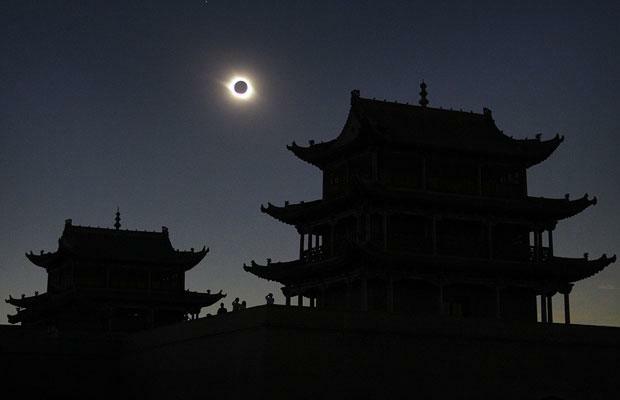 Solar eclipse of 1 August 2008, at the Jiayuguan Fort on the Great Wall of China. Image Source: Telegraph/Reuters. At any given time there may be several dozen different series of this cycle in effect and each Saros Cycle will take well over a thousand years to complete. The ancients believed an eclipse to have irrefutable consequences if it touched a key planet in a persons birth chart. The ancients could often predict an eclipse, however they did not know what caused them. They were feared and viewed as omens due to the appearance of a dark shadow consuming the light of the moon. The reddish color of the moon during a lunar eclipse put fear in their hearts believing that the moon was being eaten or consumed. Though the ancients did not understand what modern science has discovered about the causes of an eclipse, they did know that an eclipse could change the course of history for an individual, or a nation. A solar eclipse signifies a fresh start which can also bring about radical change, like a new chapter beginning in your life. The effects of a solar eclipse are shown in the outward expression of our circumstances and can present us with very exciting and joyous developments. What develops due to a solar eclipse will be visible to you and others in your life. On the other hand, if a solar eclipse afflicts planets in your birth chart, the message of the eclipse could present a challenge that must be overcome before something new develops. A lunar eclipse occurs at the time of the full moon when the sun and moon are in opposition to one another. The sun and moon are at the point of maximum stress and represent the culmination of events or the end of a matter. Lunar eclipses often influence relationships because of the polarity between the sun and moon. A lunar eclipse becomes a catalyst from which dramatic change occurs based on what has already been experienced in your life. A lunar eclipse often brings with it a sense of finality, or unavoidable conditions to the area of your chart that it touches. There you have it. According to the astrologers, the wheel is turning. For those who prefer a more sober outlook, the NASA page on eclipses is here. Sam Klemke recording his life. Image Source: Hypervocal. Sam Klemke began filming himself 35 years ago long before the term vlogger even existed using Super 8 film and a separate audio recorder because his camera couldn't record sound. 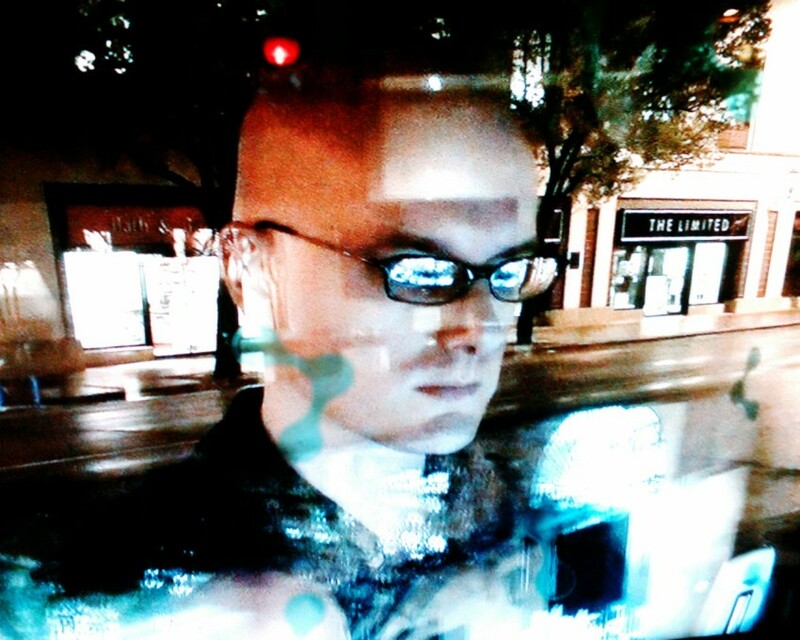 He hoped that one day he would have the technology to merge the video and audio. 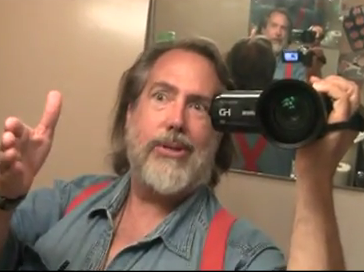 He has been recording himself every year for the last 35 years, and last month he posted the edited clips in a single video that shows his life backwards. The video has gone viral, racking up nearly 700,000 views online. Klemke now finds himself doing interviews with stations all over the world. He is even being called the first vlogger by some. "I've always had this fascination that you could capture time with a movie camera," he says to KVAL News. "I remember being fascinated that you could look at a film with Jimmy Stewart in the 70s. And then you could also look at one of him in the 30s and you could see, oh my God, you could see a 40-year span of his life right before your eyes with two separate movies." 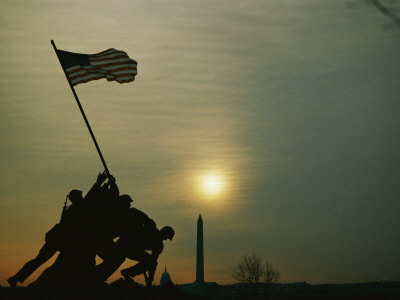 Today is Memorial Day in the United States, when Americans commemorate their combatants who have died in all wars. For my earlier posts on Remembrance Day, go here, and a second post on the topic, including an American video for Memorial Day, go here. Among American First World War poets, John Allan Wyeth has recently been rediscovered by critics for his plain language and avoidance of romantic conventions of the time (see here and here). A famous American World War II poem is The Death of the Ball Turret Gunner (1945) by Randall Jarrell. One anti-war poem condemning death in the Vietnam War is John Balaban's In Celebration of Spring (discussed here). In an interview below, Robert Hedin ponders the dearth of poetry coming from soldiers who served in the Gulf War and current wars in Afghanistan and Iraq. He also feels that technological changes in weaponry contributed to a decline in the idea of romantic heroism that was expressed up to World War I; this, in his mind, has increased the disillusionment and harsh imagery evident in American war poetry subsequently written. Interview with Robert Hedin, editor of Old Glory: American War Poems from the Revolutionary War to the War on Terrorism. Audio Source: NPR.